Our BendDesk video has been watched 1.5 million times (Feb 18, 2019). Der digitale Schreibtisch, WDR, Mar 14, 2012. BendDesk on World Usability Day Aachen, Nov 10, 2011. BendDesk on Channel One Russia, May 14, 2011. BendDesk in QUO magazine (Spanish), Jan 25, 2011. BendDesk featured on engadget, gizmodo, golem (German), cnet and heute.de (German), Dec 6, 2010. See BendDesk at the Tag der Informatik 2010 on Dec 3, 2010. Forscher entwickeln den Schreibtisch der Zukunft, Handelsblatt Online, Dec 1, 2010. BendDesk is a multi-touch desk environment that seamlessly combines a vertical and a horizontal surface with a curve into one large interactive workspace. This workspace can be used to display any digital content like documents, photos, or videos. Multi-touch technology allows the user to interact with the entire surface using direct manipulation and multi-touch gestures. We took special care for ergonomics. 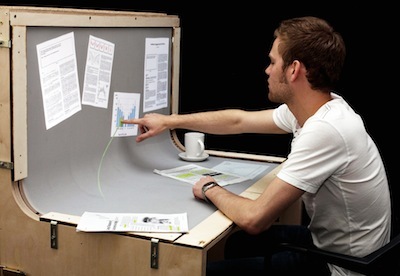 Users can comfortably sit at the desk and place everyday objects on it. Have a look at the video! Watch our video on YouTube or as HD QuickTime video (30 MB). BendDesk is a research project by Malte Weiss, Simon Voelker, Jan Borchers from the Media Computing Group, and Christine Sutter from the Department of Work and Cognitive Psychology. It is funded in part through the German B-IT Foundation. Thanks to Christian Remy for his help on the project. Please contact Simon Voelker for further information. Simon Voelker, Christine Sutter, Lei Wang and Jan Borchers. Understanding Flicking on Curved Surfaces. In CHI '12: Proceedings of the SIGCHI Conference on Human Factors in Computing Systems, CHI '12, pages 189–198, ACM, New York, NY, USA, 2012. Stefan Hafeneger. Starfire, 20 Years Later: A Vision Revisited. Diplomarbeit, RWTH Aachen University, Aachen, November 2011. Malte Weiss, Simon Voelker, Christine Sutter and Jan Borchers. BendDesk: Dragging Across the Curve. In ITS '10: Proceedings of the ACM International Conference on Interactive Tabletops and Surfaces, pages 1–10, ACM, New York, NY, USA, November 2010. Malte Weiss, Simon Voelker and Jan Borchers. 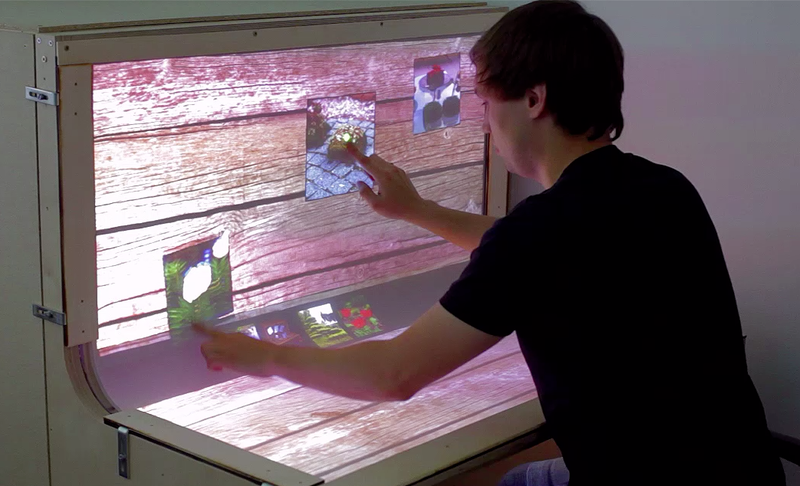 The BendDesk Demo - Multi-touch on a Curved Display. In ITS '10: Adjunct Proceedings of the ACM International Conference on Interactive Tabletops and Surfaces, pages 317, ACM, New York, NY, USA, November 2010. Simon Voelker. BendDesk: Seamless Integration of Horizontal and Vertical Multi-Touch Surfaces in Desk Environments. Diplomarbeit, RWTH Aachen University, Aachen, Jun 2010. Malte Weiss, Simon Voelker and Jan Borchers. BendDesk: Seamless Integration of Horizontal and Vertical Multi-Touch Surfaces in Desk Environments. In Adjunct Proceedings ITS ’09. ACM, ACM, New York, NY, USA, 2009. Curve is a curved multi-touch surface by LMU Munich.